The photo submitted by Valentin shows a dark blue flag with a negative imaqge of the seal in golden yellow. The edges of the flag are not visible on the photo, but I think that 3:5 over all ratio with the emblem's diameter at 75&percent; of the flag's height is a good conjecture. 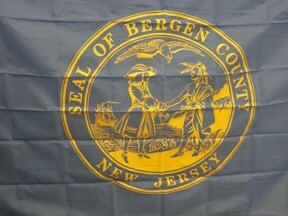 The attached [us-nj-be.gif] uses those values and the rendition of the seal shown in Wikipedia. It does differ slightly from the one on the flag.